Cuddle up with your own customized hot water bottle cover you've designed yourself. Whether it's for the family or an extra special touch for your winter inspired hotel rooms, you can print unique designs and beat the chill in style. Handmade from soft, fire rated polar fleece fabric, hot water bottles printed with original art bring extra warmth to the soul. Your custom printed hot water bottle cover is the ultimate way to get cozy on a cold day; made using soft, polar fleece, it's super cuddly and warm. Featuring your design on the front and either ivory, blue, black or pink for the back, you can easily complement your personal style and other winter accessories. Your hot water bottle comes complete with the bottle, or you can have just the single cover if you've already got an existing bottle to use. Your hot water bottle is UK handmade and has a pouch opening at the back, protecting your skin from the hot rubber. The polar fleece fabric is fire rated with water repellent properties. If you've already got a hot water bottle, you can simply just select the cover, or receive the bottle with your order too. Your hot water bottle cover is expertly printed and handmade to order in our London studios. Using a specialist printing process that fuses the ink deep into the polar fleece fibers, we can guarantee your designs won't fade or deteriorate over time. The fleece is cut to size, following the classic hot water bottle pattern, and then hand sewn to another piece of fleece fabric that's printed with your choice of 4 colors; ivory, blue, black or pink. The back has a slip pouch that has been cut in, designed for you to insert and remove the bottle with ease, whilst still maintaining safety. Your fleece hot water bottle cover can be machine washed at 30°c. Remove the bottle before putting in the washing machine. When preparing your hot water bottle, please take care pouring the boiling water, and take care to ensure the back pouch flap is closed securely to protect your skin. 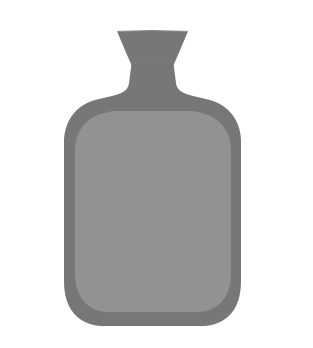 Our water bottles comply with British safety standards BS EN 1970:2006 for hot water bottles. Please follow all instructions provided, and use common sense to reduce harm to yourself or others. Your designs are printed onto the front of the hot water bottle cover, leaving you with a choice of 4 colors for the back. There's 2 neutral colors - ivory and black - and 2 pastel colors - baby blue and soft pink - allowing you to create a stylish contrasting design. Printing on polar fleece results in a beautiful print reproduction, and the brushed surface means sharp lines are softer. Bear in mind the bottle neck, making sure to keep important features on the main body of the cover. Cuddle up as a family together with your very own unique hot water bottles, handmade and printed. They're such a joy to bring out in the colder months, and help you unwind and relax after being out in the blustery weather. Printed to complement your pair of pajamas, interior home furnishings or to identify each member of the family, these are a fun addition to your winter accessories. If you own a country lodge or log cabin, hot water bottles for every hut could be a fabulous special touch for guests when they unwind for their evening in front of the fire. Printed with your logo, they help to extend the brand whilst keeping in line with your establishment's theme and decor. You could even create His and Hers, so you can tailor them to all types of couples who visit. A hot water bottle cover is an essential for every warm, loving home, so add a range to your design brand's store and offer customers of your products the chance to enjoy your artwork on such a cozy, cuddly item. Expertly printed and handmade, hot water bottle printing allows you to show off your original art on everyday, household items that'll get lots of use and love. Does the cover come with a bottle? You have the option of whether your hot water bottle cover comes complete with a rubber bottle, or simply just the single slip cover. This is ideal if you've already got a bottle you can use. What size bottles do they fit? The fleece covers measure 14.96" x 8.26", and fit standard 1.8L (12.60" x 7.48") and 2L (12.79" x 7.87") bottles. If you choose to have include the bottle with your order, this measures 13.77" x 7.87". You design the front of your hot water bottle cover, and get to choose from 4 colors for the backing fabric. The back comes in either ivory, black, blue or pink so choose a complementary color. Cuddle up with a quirky hot water bottle that's been designed by our #ContradoCreatives. These hot water bottle covers have been printed with their original pieces of art, and are the perfect way to unwind and relax in unique style. Hot Water Bottle, PINK GRAFFITI CANDY MARBLE style!